A personalised print that will be treasured forever. Unframed. A truly personal, unique memento for every special occasion. Very popular at weddings, christenings and special birthday parties. 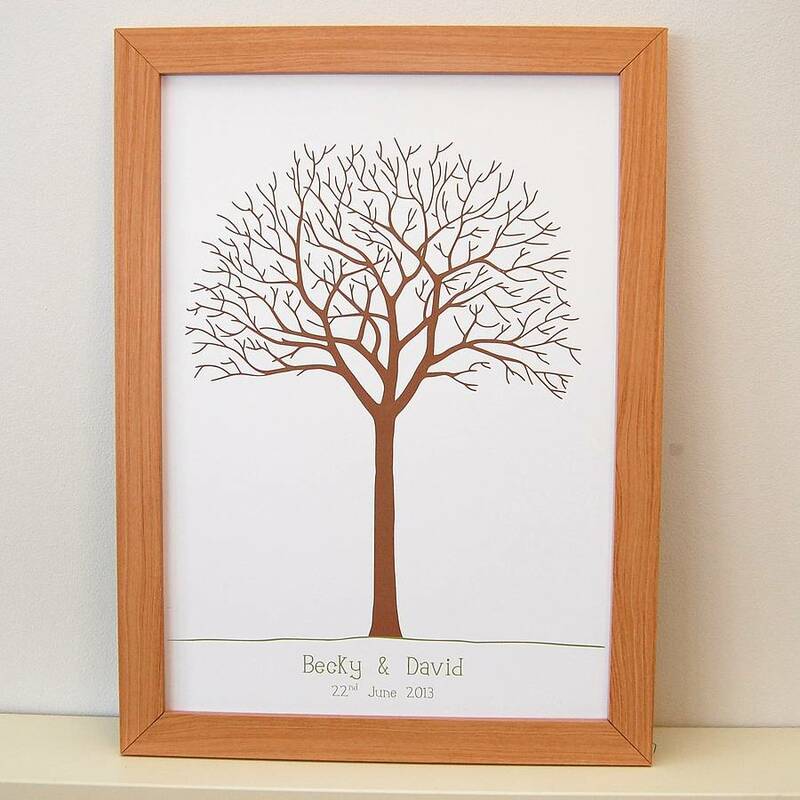 A beautiful keepsake and a great alternative to a traditional guest book. Printed with your personalisation and supplied with your chosen set of coloured ink pads. The presentation gift box is a rigid white box which will not only protect your gift further during delivery, but is a beautiful way to present your unframed poster if it is a gift. 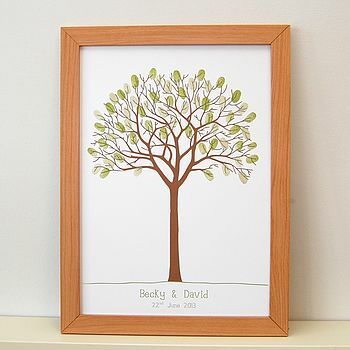 Your family and friends then fill the branches with their fingerprints - watch it blossom as they 'leaf' their fingerprint onto its branches and sign their name. Included is: your personalised, blank tree print which as standard is unframed, two green ink pads are supplied as standard with the option to add an additonal third accent colour, a free standing instructional sign to guide your guests, a 'test your thumbprint here' page. Your chosen personalisation can be absolutely anything you wish and as many characters as you wish. If there is a lot of text, we will have to use a smaller font but be assured we will always make it look as beautiful as possible. 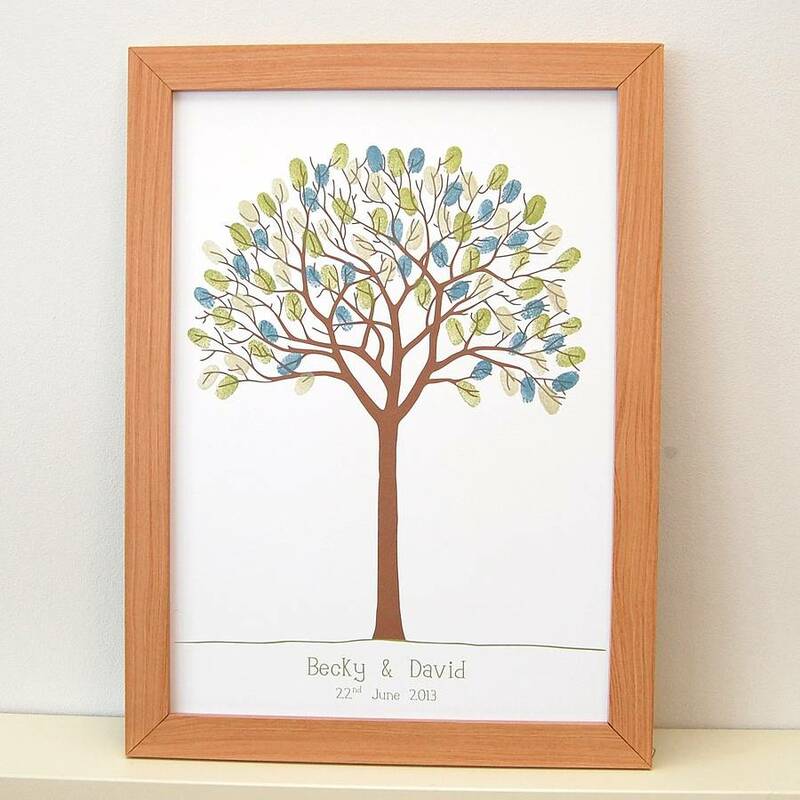 Personalise the wording on the poster with whatever message / names / date you like - for example bride & grooms' names, child's name for baptism, family surname or a personal message. Please be aware that whatever you enter on the order form, and however you type it (capitals/lower case letters, 'and' or '&') is how it will appear on the print. Please note the 'fun' font does show a lower case 'b', as 'B', such is the 'fun' and 'unique' style to the font. You can then choose the font styles and colour. The largest sized A3 poster will fit up to 100 index fingerprints. Available in smaller sizes - A4 and 10 x 8". You can also add replica, re-prints to your order for only £4.50 each (print only included). Printed to order in the Lancashire by Love Those Prints on high quality 280gsm white card. The ink pads are chalk ink and acid free. The largest poster measures 42 x 29.5cm and is supplied unframed. This is a standard A3 size. The medium poster measures 29.5 x 21cm and is supplied unframed. This is a standard A4 size. The small poster is a standard 10 x 8" framed size. It is also supplied unframed. The presentation gift box is a rigid box in either white or black, which will not only protect your gift further during delivery, but is a beautiful way to present your unframed poster if it is a gift. It is available in either Large - to fit the large A3 poster, or Medium- which fits both the A4 and the 10x8 sized prints.